Women’s Boxing Olympic Trials Day Four, 2/16/2012! Last night was a WAR: Twelve fighters on the precipice of elimination from the tournament fought their hearts out to claim a place on today’s bout roster, all of their hopes and dreams for Olympic glory on the line. For flyweight Tyrieshia Douglas that meant a crescendo of battle tactics that saw her to first overwhelm and then finally stop Taversha Norwood at 1:18 in the fourth round when the referee ended the bout. Virginia Fuchs also fought a non-stop battle from the outside to defeat Alex Love by a 21-16 decision. Douglas and Fuchs will battle each other tonight in the Challenger’s bracket. The lightweights were equally exciting. Tiara Brown, the 2011 USA Boxing National Championships silver medalist proved herself a winner in a very close tactical battle with Bertha Aracil that saw the momentum shift from Aracil to Brown with a final score of 12-11. In the other lightweight contest, Mikaela Mayer was relentless in her pursuit of Asia Stevenson who was given two standing eight counts at the end of the second round, one at the end of the third and was finally stopped at 1:24 in the fourth round. Mayer’s style was relentless from the outside but she showed no fear in the clinches. Stevenson fought as a southpaw and showed a nice stinging jab in the first round, only to lose momentum from the second round on. The battle tonight between Tiara Brown and Mikaela Mayer should certainly prove to be an exciting matchup! Franchon Crews fought a tough slugfest against Tiffanie Hearn, but managed to pull off a close decision 27-26. Both fighters fought in close and lost points for “wrestling.” In the last contest of the night, Raquel Miller did her best to slug it out with Andrecia Wasson, finally winning the contest by a score of 7-6 — on her birthday no less. Neither fought a particularly clean fight, but Miller proved to be more effective. Crews and Miller will meet tonight in what will likely be another all out war. 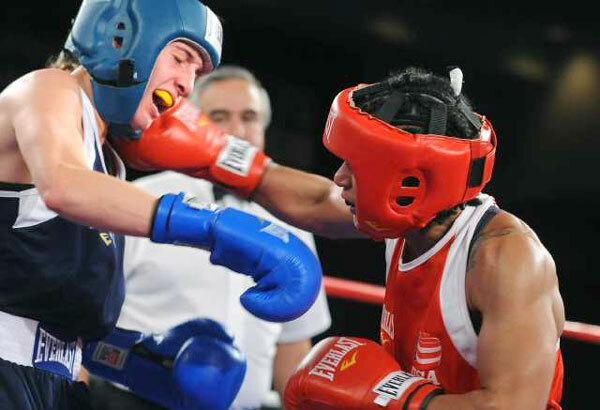 Press coverage includes the following: USA Boxing, AP’s Greg Beacham, Detroit Free Press, ESPN, and Sarah Deming’s Day three report on Huffington Post. Tonight’s bouts can be viewed online at the link here. Tonight’s Bouts are a combinations of the winner’s bouts from Valentine’s Day and last night’s successful challengers. There will be a total of six fights, two from each division. 112 lbs/winners bracket: Marlen Esparza, Houston, Texas vs. Christina Cruz, New York, N.Y.
132 lbs/challengers bracket: Tiara Brown, Lehigh Acres, Fla., vs. Mikaela Mayer, Los Angeles, Calif.
165 lbs/winners bracket: Claressa Shields, Flint, Mich., vs. Tika Hemingway, Pittsburgh, Pa.
165 lbs/challengers bracket: Franchon Crews, Baltimore, Md., vs. Raquel Miller, San Francisco, Calif.
« Women’s Boxing Olympic Trials Day Three, 2/15/2012!